At the bottom of the Garden: Oh, for the love of beans and peas! Oh, for the love of beans and peas! Ok, so Bryn first insisted on feeding himself, well, basically from the point he started eating solids at about 8 months of age. This, however, did not translate into actually using any form of utensils. 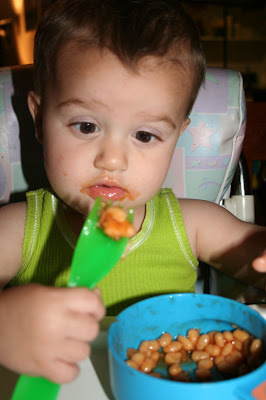 Much to my ILs dismay, at Christmas time, Bryn was still only interested in eating with his hands (age about 16 months)... We've just let this be, as we much prefer he eat "tidily" with his hands, than "messily" with a utensil... So, a couple of weeks ago he seemed to realise that (for the most part, LOL) the rest of us consistently used those shiny implements and so, of course, he wanted to have a go. At first he just used a fork to stab food with, and BOY was he impressed with THAT!!! 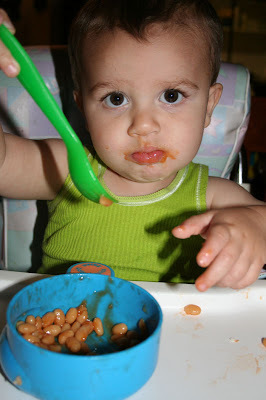 Then this week we had a couple of more liquidy things on the menu (baked beans one night and soup another night), and there was NO WAY he was going to allowed Dave or myself, or even Erik (we thought maybe having Erik feed him might be novel enough for him to forget about the spoon)... So, I had to just wear (quite literally, a couple of times) him messing around with an implement in a liquid. Later in the week, we had chicken and vegetable soup. 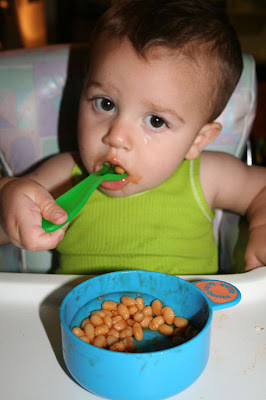 He scooped up all the liquid (dumping out any pesky "lumps" that landed on his spoon), then realised the peas looked like baked beans and proceeded to fish out all the peas, leaving everything else, LOL! He has also, recently, discovered salmon... I'm having salad and one of those gourmet greenseas salmon mini tins for lunch and he LOVES smoked salmon and salmon with sundried tomatos and basil. In fact, I've had to make him salmon sandwiches for lunch so I can scoff down my lunch (before he finishes his) in relative peace. Anything he doesn't want to eat (lettuce, most vegies except beans and peas) he just makes this indignant, impatient, "Hmmmph!" sound over and then pushes away! Dave had to go beg some money of his parents the other day. I really wanted to "save" him this embarrassment, because I could (got a cheque, sold a pair of longies and sold my treadmill), but then I realised, if I did that, other things wouldn't happen that need to happen. Dave's parents are always will to help us out, CANNOT fault them on that. That said, helping often comes accompanied with forceful "advice" on how to run our lives... So, in many years, we haven't asked for help, but this week Dave did have to ask for help, an in return they are putting pressure on him to get his lisence and get a new, or at least a second, job. These are, of course, things I want to see happen, so I'm not saving Dave from that pressure. Also, we got a call on Thursday and a guy from our real estate agency is coming over on Monday evening to evaluate this house for the owners. Now, this might lead to nothing, but it might mean the owners are seriously considering selling (and why wouldn't they, another couple of years and this place is going to need some MAJOR renos on the boundary fences and some of the internal walls)... Now, that could mean another investment owner might buy it, or a first time owner occupier might go for it. Dave and I had originally planned on moving out when this lease was up in August, but recently I'd been wondering if we could really justify spending money on a move, or even afford what will, NO DOUBT, end up being a more expensive rental. Now, the choice might be out of our hands. I'm a bit excited though because I had been asking for a way to move out earlier (without breaking the lease) from the Universe, while also asking for a place right near the boys' school for $300 or under per week... Looks like the Universe is listening!